Chicago has made some real strides toward becoming a world-class cycling city since Rahm Emanuel was elected mayor, promising 100 miles of protected bike lanes and bringing on Gabe Klein as transportation commissioner. 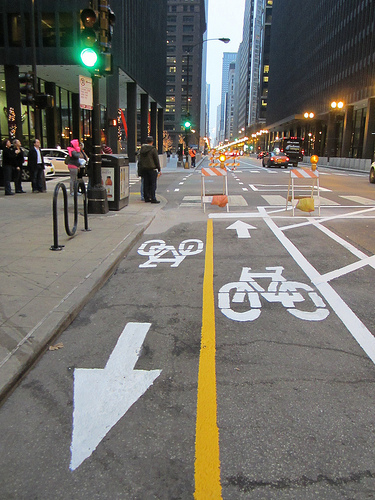 And that has never been more evident than now, as the city DOT moves ahead with a new, two-way protected bike lane on Dearborn Street, bringing safe cycling to the heart of downtown. Let’s celebrate the lightning-fast progress of this pioneering facility, which CDOT says will be completed, including striping, signage, bollards and traffic signal timing, by mid-December, if the warm weather holds up. The bike-specific traffic signals will be crucial for guiding southbound bike traffic and preventing conflicts between northbound bike traffic and left-turning cars. One benefit that has already resulted is that, with the removal of one of the three travel lanes, Dearborn already feels calmer and more civilized, like a bustling neighborhood retail street rather than a typical downtown speedway. Elsewhere on the Network today: The Wash Cycle reports that civil trials in Maryland almost always fault pedestrians for being hit by cars. Bike Delaware says kids shouldn’t be trapped in their neighborhoods by car-centric planning. And David Alpert of Greater Greater Washington writes in the Washington Post that we need to stop tolerating dangerous street design.